Zlatá mince Kanadský javorový list, náhodný rok, 1/4 oz The Canadian Gold Maple Leaf Coin, the official gold coin of Canada is produced by the Royal Canadian Mint (RCM). One of the purest regular issue gold coins in the world, it features a gold content of 9999 fineness (24 carats). The gold used is sourced exclusively from Canadian mines. 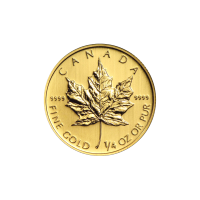 First issued in 1979, the gold content was measured at 999 until 1983. Offered in fractions of 1/20 oz, 1/10 oz, 1/4 oz, 1/2 oz and 1 oz. The coins are legal tender denominated in Canadian Dollars ($1, $5, $10, $20, $50). Each of the coins maintain a similar design on both the obverse and reverse. Some special issues feature colouring, privy marks and other unique attributes. These coins are discounted as they may be tarnished, scratched or visibly handled. Year and condition are subject to availability.